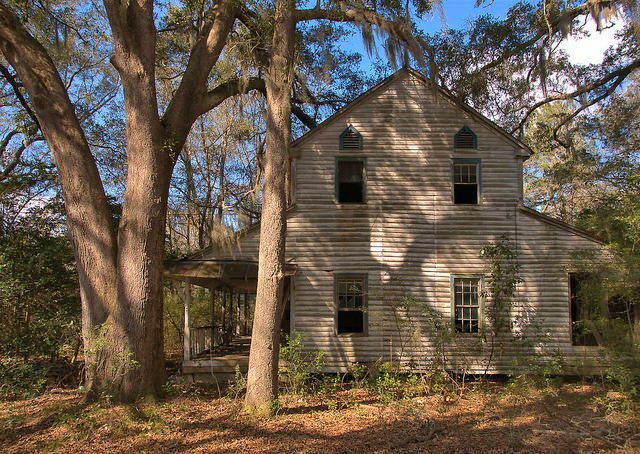 I believe this was built circa 1870, when Long County was still a part of Liberty County. Pamela T. Jordan suggests: it may have been once owned by the Vickers family. Marion and Margaret Howard had it moved to this spot. Margaret’s brother, Homer Breckinridge owned the house next to it and Hollis and Nancy Brady lived on the other side. When the Vickers family owned it it was on the dirt road running parallel to Highway 99. It was moved when I was about in the 6th grade. Margaret was the daughter of longtime Ludowici merchants Rufus & Ernestine Smiley. It was possibly owned by the Chapmans before the Vickers. I love the symmetry. Nice home it would have been. Hi Brian & Mike, I am 99% sure this photo is of Mr. Rufus & Mrs. Ernestine Smileys personal home back in the 1950’s & moving forward. It was a very nice house especially for that time period. I remember as a small child that I first saw this house & thought it must have been the largest home in these parts. Not sure when built but it was a fairly old house in the 1950,s. Great photos. Shame to see this old home abandoned & falling apart!! Thanks, Wendell. That’s what Mike though, as well. Marcia Futch mentioned that her daughter Margaret Howard lived there later on. I think the house could be saved. Hope someone will try to do so! I really like this house. I have borrowed several of your photos–giving you credit in the post and being sure that the blog name appears on the screen shot–to show members on the Abandoned Houses of the South group.